Can be used for group play dates, team management and player availability. Also can be used for lesson signups. 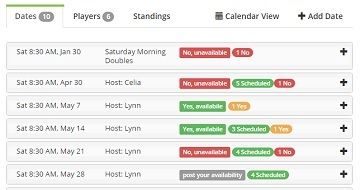 The main group page shows all scheduled matches with member option to change their availability. It also shows the number of player RSVP's. 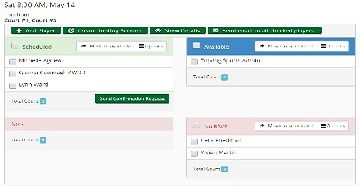 Create and maintain your participant list here. Each player must have an account in Topdog. 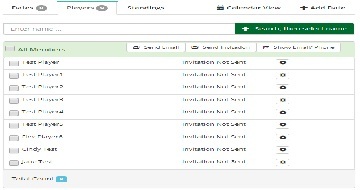 You the administrator can search the database, list players who already have Topdog accounts, and quickly create accounts for new participants. Send them an invitation so that they can confirm that they want to participate in this group. If a player changes their availability they don't need to accept the invitation. This is the same as accepting the invitation. Move players to scheduled or move them to any other RSVP response. You can also send them an email letting them know they are scheduled to play or to remind them to enter their availability.